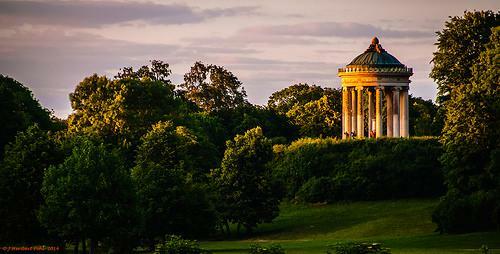 The Monopteros is a small neo-classical Greek temple on a hilltop, built in 1836 in the English Garden. The Monopteros is a small neo-classical Greek temple on a hilltop, built in 1836 in the English Garden. It provides a great few over the park and Munich with the Bavarian Alps in the background.